The European Union will impose provisional safeguard measures on imports of steel products on Thursday to prevent them flooding into Europe after the US also placed tariffs on incoming steel, the foreign ministry said Wednesday. 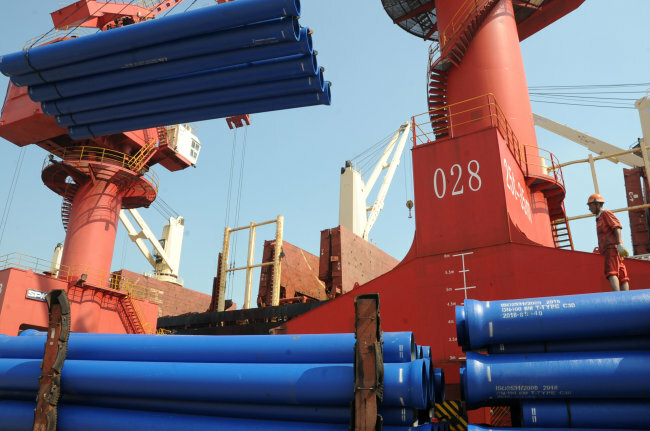 The EU announced it will impose an additional 25 percent tariff on 23 kinds of imported steel products if their volumes exceed average quotas over the past three years, the Ministry of Foreign Affairs said in a statement. "The EU has taken the measures, saying an increase in steel imports could post serious harm to EU steelmakers. They cited worries that steel products no longer shipped to the US could flood EU markets," a ministry official in charge of the matter said over the phone. To avoid any EU tariffs, the Korean government has asked the EU to exclude Korean steel products from those that will face an additional tariff because Korean steel products shipped to the US and the EU are different, the statement said. "In fact, the kind of steel products exported to the US could not be shipped to the EU," the official said. The EU move comes after the US recently slapped tariffs on incoming steel and aluminum products. As for the 23 products targeted, Korean steelmakers annually export 3.3 million tons of products worth $2.9 billion. An additional tariff could weigh on their businesses. Korea is one of main exporters of steel to the EU, along with China, India and Russia.